I have this buyer who has the same problem with me. For me, it's a simple problem that I didn't noticed. 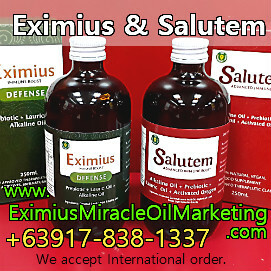 Until I took Eximius Oil for just a few days as a supplement. Until I felt different and better. Then that's the time I thought of, I have a little health problem all along. This buyer explained to me her health problem. 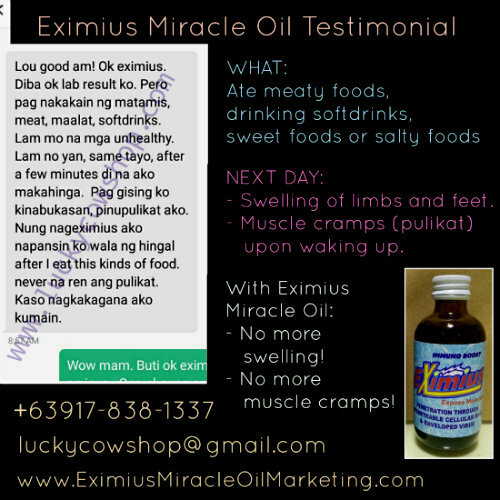 I told her that we're the same, and is so happy that Eximius Oil can also help her. Here's her problem. We're so the same! Everytime she eats meaty food, drinks softdrinks and eat sweet and salty food, she'll feel hard to breathe a little later. The next day, she might have swelling limbs and/or feet. She would also feel muscle cramps upon waking up, which would subside after a half minute. Lou good morning! Eximius is ok. Isn't it my laboratory test result is okay. But if I ate foods that are sweet, meaty, salty, softdrinks. You know those unhealthy ones. You know that, we're the same, after a few minutes I can't breathe. When I wake up the next day, I got muscle cramps. After I take Eximius, it seems like I don't catch my breathe after I eat those kinds of food. I do not experience muscle cramps anymore. But I felt like eating now. She still needs to control her eating even if she do not feel those muscle cramps and shortness of breathing when eating unhealthy food. Prevention is still the best.